Vitamin A 3500 IU (29% as Beta Carotene) - 70%, Vitamin C 90 mg - 150%, Vitamin D3 400 IU - 100%, Vitamin E 30 IU - 100%, Vitamin K 25 mcg - 31%, Thiamin (Vitamin B1) 1.5 mg - 100%, Riboflavin (Vitamin B2) 1.7 mg - 100%, Niacin 20 mg - 100%, Vitamin B6 2 mg - 100%, Folate (folic acid) 500 mcg - 125%, Vitamin B12 6 mcg - 100%, Biotin 30 mcg - 10%, Pantothenic Acid 10 mg - 100%, Calcium 200 mg - 20%, Iron 18 mg - 100%, Phosphorus 109 mg - 10%, Iodine 150 mcg - 100%, Magnesium 100 mg - 25%, Zinc 11 mg - 73%, Selenium 55 mcg - 79%, Copper 0.9 mg - 45%, Manganese 2.3 mg - 115%, Chromium (as Chromium Picolinate) 35 mcg - 29%, Molybdenum 45 mcg - 60%, Chloride 72 mg - 2%, Potassium 80 mg - 2%, Boron 150 mcg - *, Nickel 5 mcg - *, Tin 10 mcg - *, Vanadium 10 mcg - *, Lutein (flower) 250 mcg - *, Lycopene 300 mcg - *. 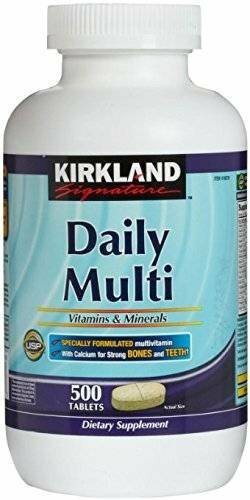 Kirkland Signature Daily Multivitamin and Multimineral Pack is specially formulated based on the latest research in nutritional science. This product provides a complete, full-potency formulation of vitamins, minerals and Ginseng to help deliver essential nutrients that may be missed if you are not eating a balanced diet. With today's demanding lifestyles and busy schedules, finding the time to eat a balanced diet isn't always possible.It provides the essential nutrients necessary for a balanced diet and to give you that Energized Feeling.